"Rattlesnake Awareness" November 12, 2011 at MK Nature Center, originally uploaded by EcoSnake. 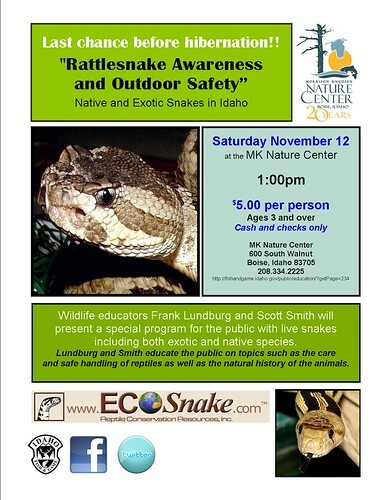 Scott and I will be presenting our “Rattlesnake Awareness and Outdoor Safety” program this Saturday, November 12, 2011 at 1:00 pm at the Idaho Fish and Game MK Nature Center in Boise. If you live in the Treasure Valley area and can’t make it to the BSU game, this is a great alternative!